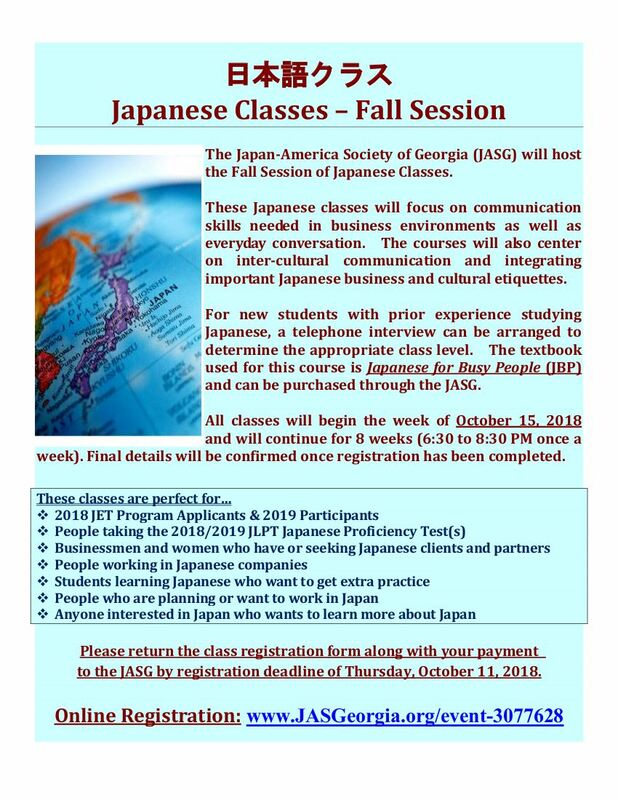 These Japanese language courses emphasize communication skills needed for business, tourism and social interaction. The courses also integrate values of the Japanese market so that students will not only develop competence in the language but also acknowledge of the business and cultural environments of Japan. All classes begin the week of July 23, 2018 and continue for 8 weeks. Classes are held from 6:30pm – 8:30pm at the JASG office located at 3121 Maple Drive, Suite 224, Atlanta, GA. Please note, meeting time is subject to change. The cost for the course is $200 for JASG members and $245 for non-members (please include amount in check). All non-members who enroll will be given a full one-year membership into The Society ($45 value). Textbooks are available for $25. After the first class, no refunds will be issued and no fee credit for enrollment into future classes will be allowed.